The courses at Norwich are taught by doctorate level faculty and their experience and credentials were admirable. The healthcare industry needs nurses with leadership, passion, and expertise. That’s why the Norwich online Master of Science in Nursing program was created and has evolved to meet these critical demands. Our program is designed to help you build the essential skills needed to pursue advanced roles in healthcare systems leadership, nursing education, or the growing field of nursing informatics. With changing health care legislation and an aging workforce, expert nursing professionals are needed now more than ever. Whether your goal is nursing informatics, nursing leadership, or nursing education, our online Master of Science in Nursing program can help you prepare for critical leadership positions aligned with your career goals and interests. Join a program accredited by the Commission on Collegiate Nursing Education (CCNE). Apply newly acquired skills in real-time and drive positive change within your organization well before you graduate. Qualify to sit for the National League for Nursing (NLN) Nurse Educator Certification Exam through our Nursing Education track. Qualify to sit for the ANCC Informatics Nursing Certification Exam through our Nursing Informatics track. Enroll with no GRE or GMAT requirements. Help us learn more about your experience and see if you qualify for the Master of Science in Nursing program. Norwich’s online Master of Science in Nursing (MSN) program begins with 3 six-credit core courses that focus on the roles of the advanced nurse, health care systems, practice and policy, theoretical foundations of practice, research for evidence based practice and quality improvement practice, informatics and technology. Each core course is 11 weeks in length and includes 100 hours of mentored clinical practice and experiential learning with your chosen practicum site. The remaining courses are focused on the specialty of your choice: nursing education, nursing informatics, or healthcare systems leadership. Note: If you enrolled in the MSN program on or prior to June 2017, please refer to this curriculum map. Pursue a range of leadership roles in nursing education, nursing informatics, or healthcare systems leadership. Demonstrate a broad-based knowledge of health systems and essential skills in communication, data analysis and policy implementation, problem solving, critical thinking, research, evidence-based practice, and management. This seminar represents the foundation of graduate level nursing education. It provides a global perspective of the healthcare system and helps the student assess and analyze the healthcare system as the context for graduate level nursing practice. The relationship among various stakeholders including consumers, providers, regulatory agencies and policy makers are explored as well as their impact on healthcare delivery. This seminar also emphasizes health policy and advocacy, interprofessional collaboration, and clinical prevention and population health. Analysis of the advanced nursing role is conducted within the context of the healthcare system in relationship with complex social, economic, diverse, technologic, legal, ethical and political environments. 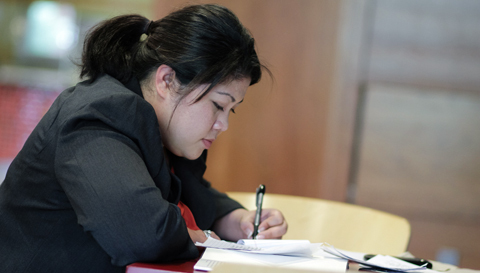 The student participates in a mentored practicum of 100 hours during which the student completes the seminar’s experiential learning assignments. This practicum experience introduces the student to advanced nursing roles in the delivery of health care and an opportunity to develop reflective practices and appreciative inquiry. This seminar examines the application and integration of evidence in leadership roles and decision making. The student explores nursing and other relevant theories from the social, organizational, and behavioral sciences to provide a theoretical foundation for evidence-based practice. The student is equipped to critically appraise and utilize research, identify researchable problems within his/her practice setting, and lead teams toward integration of evidence-based practice in healthcare. Translational science and implementation/improvement science is introduced. The seminar concludes with a brief overview of innovation and its relevance to advanced nursing roles. The student participates in a mentored practicum of 100 hours. This practicum experience provides the student with an opportunity to apply and integrate relevant evidence in their practice and develop reflective practices and appreciative inquiry. This seminar introduces the student to the fundamentals of quality improvement science, and the use, implementation and impact of informatics and healthcare technologies on quality and safety in healthcare. Students examine quality improvement models in the delivery of healthcare and measures for quality improvement initiatives. The business case for quality is discussed as well as leadership and teambuilding for quality improvement in a continuous learning organization. The student conducts a microsystem analysis and prepares a performance improvement project proposal. The student participates in a mentored practicum of 100 hours. This practicum experience provides the student with the opportunity to conduct a clinical microsystem analysis, participate in a quality improvement project and develop reflective practices and appreciative inquiry. Nurse educators must have expertise in advanced clinical concepts, such as pharmacology and health assessment, curriculum and instruction, as well as measurement, assessment, and evaluation. Mastery of these topics is the hallmark of the Norwich nursing program. Completion of the education track also enables students to be eligible to take the National League for Nursing (NLN) Nurse Educator Certification Exam. This 22-credit concentration is traditionally completed in two and a half semesters, but may also be accelerated by completing the five courses over one semester. Please talk with your Norwich advisor for more information and to decide which path fits your schedule. Note: If you entered in the nursing education concentration on or prior to June 2017, please refer to this curriculum map. This course builds upon basic pharmacology knowledge in order for the master’s-prepared nurse to apply knowledge of medications to the care of clients across the lifespan. The course emphasizes principles of pharmacology and pharmacotherapeutics of the major classes of medications as well as principles of safe medication use. This course builds upon basic health assessment to prepare you to obtain a complete and accurate health assessment (including history, physical examination, and commonly used screening tools) as a foundation for advanced nursing practice with clients across the lifespan. The course emphasizes critical analysis and synthesis of physical exam data, relevant health history data, critical risk appraisal of physical and mental status, assessment of nutrition, and anticipatory guidance relevant to health promotion and disease prevention. Faculty will guide your experiences to ensure the development of diagnostic reasoning and communication skills. Students examine pathophysiological processes integral to the understanding of human health conditions and disorders of children and adults. Objective and subjective manifestations of common health problems resulting from environmental, genetic, and stress-related maladaptation are assessed and analyzed. Assessment findings, diagnostic testing, and interventions for specific health problems are discussed. Pharmacologic treatments for specific health problems are explored. The etiology, epidemiology, and pathophysiology of disorders are reviewed within the context of age and gender. Principles of pathophysiology are applied to recognize clinical signs and symptoms consistent with human health conditions and disorders during case study presentations and discussions. The impact of health promotion and disease prevention on pathophysiological processes across the lifespan are explored. This course prepares you to apply theoretical concepts related to education, learning, and nursing to teaching in nursing. Topics include history of curriculum in nursing, theories of teaching and learning, instructional design theory and methods, technology use in education, learner diversity, and curriculum development. A precepted practicum experience will coincide with didactic coursework. You will choose a preceptor/mentor in an educational role who can facilitate role development and the implementation of your work. You will be required to critique an existing curriculum, develop a course or unit of study within an existing curriculum, and implement a portion of the course or program using technology. You will also be required to participate in weekly discussions in the online classroom. Your work will become part of your portfolio and be shared with peers in the electronic classroom. This course prepares you to measure and assess learners in a variety of nursing contexts (e.g., testing, clinical evaluation, via simulation) as well as evaluate curriculum on the program level. Topics include foundations of educational measurement and evaluation, learner assessment, outcome development, the evaluation of critical thinking, and the context of nursing education. You will take part in a concurrent, precepted practicum in which you will engage in clinical education and evaluation of learners, as well as the development of assessment strategies. You will have an opportunity to reflect on the multiple roles of the nurse educator in practice. Prerequisites: completion of NR 510, 520, 530, 541,542, 551, or permission of the program director. Nurses with advanced training in nursing informatics can play a key role in disseminating data into actionable policy changes and improved patient care. Graduates of the nursing informatics concentration can develop/enhance their abilities in critical analysis, creative problem solving, solution implementation, and communication among peers and superiors. Completion of this concentration affords eligibility qualification to sit for the ANCC Informatics Nursing Certification Exam. This seminar addresses the foundational concepts of Nursing Informatics and provides the student with the opportunity to apply these concepts to the development of a Nursing Informatics project in their individual practice site. Students explore computer, information and nursing sciences as they relate to improvement of patient outcomes. The student incorporates practice standards, quality improvement processes, regulatory and accreditation standards as well as ethical practices into their project. The student also considers the design and management of database systems in healthcare. This seminar also includes reviewing information exchange standards and methods as they relate to models of care. Students apply communication and conflict resolution techniques as they create change in the process of developing their project and identify and apply data analysis principles. Students participate in a mentored practicum of 100 hours during which the student completes the seminar’s experiential learning assignments which is their Nursing Informatics project. This practicum experience introduces the student to specialized roles in that support improved patient outcomes and the opportunity to develop reflective practices and appreciative inquiry. Building on the theoretical foundations studied in NR547, this seminar examines the practice applications related to strategic planning and implementation of an informatics system in a healthcare organization. Topics include an overview of data analytics, facilitating and assessing learning in non-academic healthcare settings. Students examine a number of factors that impact the success of a system implementation while considering technical standards, system analysis concepts and data management. Students participate in a mentored practicum of 100 hours during which they complete the seminar’s experiential learning assignments which is their Nursing Informatics project. This practicum experience introduces the student to specialized roles in that support improved patient outcomes and the opportunity to develop reflective practices and appreciative inquiry. This seminar reviews concepts that are important to implementing and sustaining effective use of technology in the clinical environment. Security and privacy for the protection of privileged information, effective policy development, testing and implementation are examined. Concepts of change management as well as informatics role in community/population health monitoring and management are explored. Students study the use of technology to generate new evidence, the potential influence of emerging technologies on clinical practice and the importance of developing a caring practice in a high technology environment. Students participate in a mentored practicum of 100 hours during which the student completes the seminar’s experiential learning assignments which is their Nursing Informatics project. This practicum experience introduces the student to specialized roles in nursing that support improved patient outcomes and the opportunity to develop reflective practices and appreciative inquiry. Leading healthcare organizations as a nurse administrator takes a deep understanding of the organization from the standpoint of finance, human resources, business management, and strategic planning. Our healthcare systems track is designed to cover those critical topics and more. For the fifth course, students choose from three electives seminar that best fits their professional goals - AD 582, NR 556, or NR 555. Note: If you entered the nursing administration track on or prior to June 2017, please refer to this curriculum map. This MSN elective is designed for nurse leaders who are interested in the entrepreneurial process and acquiring innovative knowledge and skills within the context of the healthcare environment. The student is introduced to definitions and concepts that pertain to innovation, including different types of innovation and entrepreneurship as well as individual-level, organizational and institutional factors that impact the healthcare innovation process. The course examines how entrepreneurs and healthcare organizations create and capture value through sustainable innovation that meet consumer and societal needs. It explores various approaches employed by entrepreneurial healthcare organizations and considers the knowledge, skills and abilities needed to succeed in today’s competitive and global environment. Through real-world examples, the student has the opportunity to evaluate innovative healthcare ventures and viable business models for different kinds of healthcare innovations. The student participates in a 100-hour mentored practicum to apply learned concepts to practice. This practicum experience provides the student with an opportunity to explore self-awareness, reflective practices and appreciative inquiry. Students examine the critical aspects of human and financial resource management in the context of healthcare systems. Human resource management includes confronting the nursing shortage through recruitment and retention, staffing management, performance appraisal and marketing. Prevention of workplace violence and disaster preparedness are also explored as opportunities and challenges for nurse leaders in managing the healthcare workforce. Healthcare finance resource management incorporates nursing unit based budget preparation, management control systems, and operations management. The student utilizes his/her healthcare organization for the exploration, development and application of the seminar’s objectives. The student participates in a mentored practicum of 100 hours. This practicum experience introduces the student to human and financial resource management in the health care environment as well as develop reflective practices and appreciative inquiry. This course is the capstone for the Master of Science in Nursing program, concentration in Healthcare Systems Leadership. The seminar emphasizes strategic planning in healthcare, business planning and conceptual analysis of role. Discussion focuses on the acquisition of knowledge, skills and abilities (KSA) for strategic planning and for practice as a nurse leader across traditional and non-traditional healthcare settings. This capstone experience is designed so that students may apply the necessary KSA learning throughout the graduate program to guide his/her future career development. The student participates in a mentored practicum of 100 hours. This practicum experience supports the student in integrating learned knowledge, skills and abilities in the health care environment as well as develop reflective practices and appreciative inquiry. Our online Master of Science in Nursing program ends in a residency at the historic Norwich University campus in Vermont. During this time you will have the opportunity to meet with fellow students, faculty, and program staff in both formal classroom and informal settings. Academic recognition ceremonies and commencement cap off the week, and family and friends are encouraged to attend. Health care is a $1.6 trillion industry, and it’s only growing (U.S. Census Bureau). Professionals who are able to keep up with health care’s rapid changes and increased requirements are not just in demand, but well-compensated. According to the U.S. Bureau of Labor Statistics, the median wage for health care occupations and technical roles within health care was $63,420 in May 2016. Our online Master of Science in Nursing can help you pursue roles as a health policy expert, nurse administrator, or clinical nurse leader. You could even take a role in shaping health policy, leading change through information analysis, educating other nurses and health care professionals, and providing advanced care to patients in a health care setting. Read more about our MSN student outcomes. Nursing graduate experiences new career opportunities. Senior project for nursing alumna to be featured in an upcoming American Academy of Ambulatory Care Nursing-endorsed book. Our Master of Science in Nursing is led by dedicated faculty and staff members. 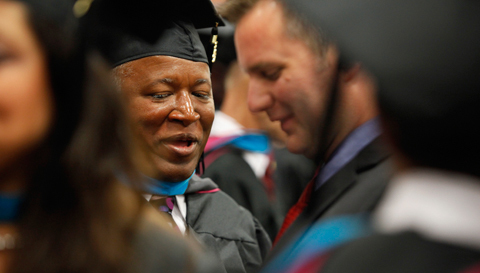 Our faculty members are experts in their fields and each hold doctoral degrees. Their interests cover a variety of nursing topics, providing you with a comprehensive understanding of the nursing field. Our staff members offer additional support from day one to graduation. Each are eager to help you pursue your academic, professional, and personal goals. Janice F. Hansen is the program director for the Master of Science in Nursing program. She earned her Bachelor of Science in Nursing from Hartwick College in Oneonta, New York and her MA in Education with an emphasis on curriculum and instruction from Castleton State College in Castleton, Vermont. She continued her studies and earned a MSN with a specialty in medical and surgical nursing from Russell Sage College in Troy, New York. Hansen has an impressive background as an educator, practitioner, and administrator. For more than 13 years, she has held numerous positions at Norwich University both in the undergraduate nursing program and in the online Master of Science in Nursing program. In the education realm, she has held faculty positions in nursing programs throughout New England. As an administrator she has served as the director of education, as a nurse manager, and director of a clinical service in area medical centers. As a practitioner, she has served as the manager of community and occupational health services for the Rutland Area Visiting Nurse and Hospice. Hansen also serves on the Advisory Board for Norwich's Master of Public Administration program. Get to know the graduates of Norwich's online Master of Science in Nursing program. The faculty provided a learning experience that was student-centered and rich with support. 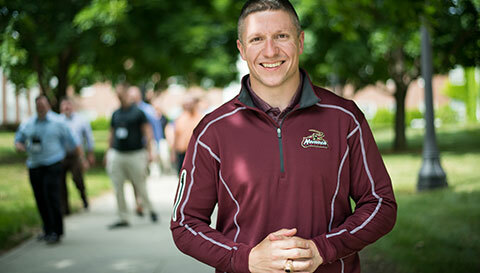 I believe that I am well prepared to take on the new challenges ahead in my career as a nurse educator because of the education that I gained at Norwich University. I have been promoted to the job that I wanted but didn’t think I could have the opportunity to get previously. Faculty members incorporated academics with real-world clinical practice. Each faculty member mentored me to acquire the knowledge and develop skills to take on the complexities of a dynamic healthcare industry. What courses can I take in the nursing program? Students gain fundamental knowledge of health systems analysis, leadership theory, and evidence-based practices in their first three course of the nursing program. Depending upon the concentration chosen, topics covered in the remaining courses include resource management, strategic planning, and health care organization; or health assessment and pharmacology, theory and methods of curriculum and instruction, and measurement, assessment, and evaluation. Choose one of three tracks: nursing education, nursing informatics, or healthcare systems leadership. Are there any grants available for students in the nursing program to help pay tuition? Grants to help pay program tuition may be available to qualified students in the nursing education track through the National Faculty Loan Repayment Program. How have graduates of the nursing program applied their degrees? Our nursing alumni have found employment with a variety of organizations including Brigham and Women’s Hospital, County of Los Angeles Department of Public Health, Dartmouth-Hitchcock Medical Center, DC Department of Health, Madigan Army Medical Center, GlaxoSmithKline, New York Presbyterian Hospital, Mary Immaculate Hospital, and Sun Healthcare Group. How are the nursing program faculty members selected? Nursing program instructors hold terminal degrees from established universities. They must demonstrate a wide range of university/college-level teaching experience and solid, practical experience in nursing leadership and education. A bachelor's degree from a regionally or nationally accredited (National League for Nursing Accreditation Center (NLNAC) or Commission on Collegiate Nursing Education (CCNE)) undergraduate nursing program. An active license as a registered nurse in state of practice that is unencumbered. International applicants who are not licensed as registered nurses in the U.S. must achieve a passing score on both English and Nursing sections of the Commission on Graduates of Foreign Nursing Schools (CGFNS) examination. A cumulative GPA of 3.00 or greater on 4.00 scale. Applicants with a GPA below 3.00 should demonstrate a GPA of 3.00 for the last 60 undergraduate hours of his/her nursing program. Undergraduate courses in statistics and research. The GRE is not required to apply, but may be requested based upon your undergraduate GPA. Depending on when you start the program, and which concentration you choose, you can expect your degree to be conferred in 18 to 24 months. Is the Master of Science in Nursing program accredited? Yes. In addition to the university’s regional accreditation, the nursing program is accredited by the Commission on Collegiate Nursing Education (CCNE). How much is the online Master of Science in Nursing program? When you apply for admission to the Master of Science in Nursing (MSN) program, you can submit transcripts and course outlines from previously attended institutions of higher education to be considered for transfer credits. Transfer credits will be evaluated on a case-by-case basis and may be accepted for up to 12 credits. Norwich complies with VA regulations and guidelines as they pertain to transfer credits. Through an agreement between Norwich University and the Department of the Army/U.S. Army Command and General Staff College, up to 12 credit hours may be awarded toward completion of the MSN program requirements.